Caramel with fondant filling with citrus marmalade. 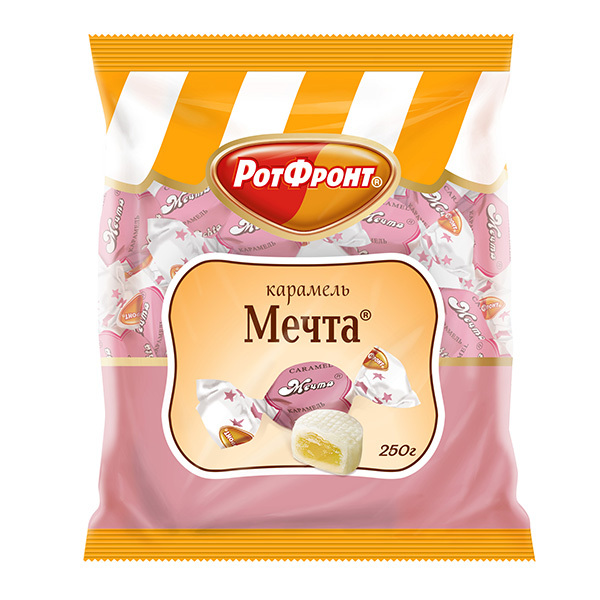 Dream - pink candy, the taste familiar from childhood! This is the real traditional caramel! This caramel is quite soft, with creamy notes. Try with green tea! The history of the brand, now known as "Rot Front", goes from 1826. It was then, almost 200 years ago, Sergei Lenov opened a "Confectionery workshop", where he produced Fudge and caramel. Two centuries later, "Rot Front" is a wide range of chocolates, caramel, halva, wafers and jelly beans. Store at a temperature of 15 to 21 C and a relative humidity of 75%.